Roaring Brook Press, 9781626728851, 160pp. Kitty’s life is really hard. Like really, REALLY hard. All she asks for is twenty-two hours a day to sleep and food to be delivered morning and night. But does she get it? No. And when Puppy and Baby get a little rambunctious during her naptime, Kitty gets bonked on the head and starts to believe she’s . . . a dog. This new dynamic freaks out Puppy, so he’s sent away to Uncle Murray’s Camp for Stressed-Out Dogs to relax with other canine campers. But guess who sneaks along? Still believing she’s a dog, Kitty fits right in. That is until she and Uncle Murray encounter a bear, and then the feline claws come out. 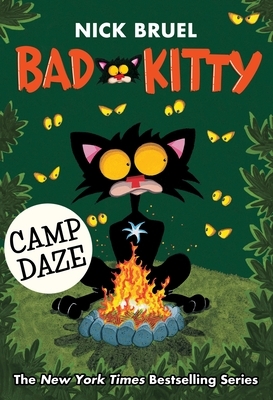 Nick Bruel's Bad Kitty Camp Daze is perfect for any kid with or without camping experience.